The Pardes Community Education courses provide in-depth, Jewish text study on a flexible schedule to meet students’ interests and availability. The program offers classes, lectures and tours on a variety of subjects. Participants can choose from daytime, lunchtime and evening courses, attend a single class, a course or the entire series. Click here for the PDF of the 2018-19 Community Education program. Download the course descriptions or read below. Does a Woman Have to Take Her Husband’s Customs? Can I Use Social Media to Warn People About Predators or is it Lashon Hara? Civil Marriage – What is its Halakhic Status? The Declaration of Independence- from Sinai or Sdei Boker? “A People that Dwells Alone”: A blessing or a curse? Rabbi Mike Feuer is a Pardes faculty member. He has learned Torah in a number of Jerusalem area institutions, including Yeshivat HaMivtar, the Mir Yeshiva and Sulam Yaakov Bet Midrash. He received his semikhah from Sulam Yaakov, where he now spends all his time when not engaged with his wonderful wife and five children. His vision of Torah aspires to rigorous analysis and a passionate love of poetry and approaches learning as a process of mutual self-development. His particular loves in Torah are the Early Prophets, the Maharal and the Bet Yosef. Rabbi Shai Finkelstein was born in Israel, attended Yeshivat Shaalavim, served in the Artillery unit of the IDF and was ordained by the Chief Rabbinate of Israel. He is currently the Rabbi of Kehilat Nitzanim in Baka, Jerusalem, and has guided its evolution beyond merely a house of prayer and Torah learning, to a center for the Kehila and for Chesed. 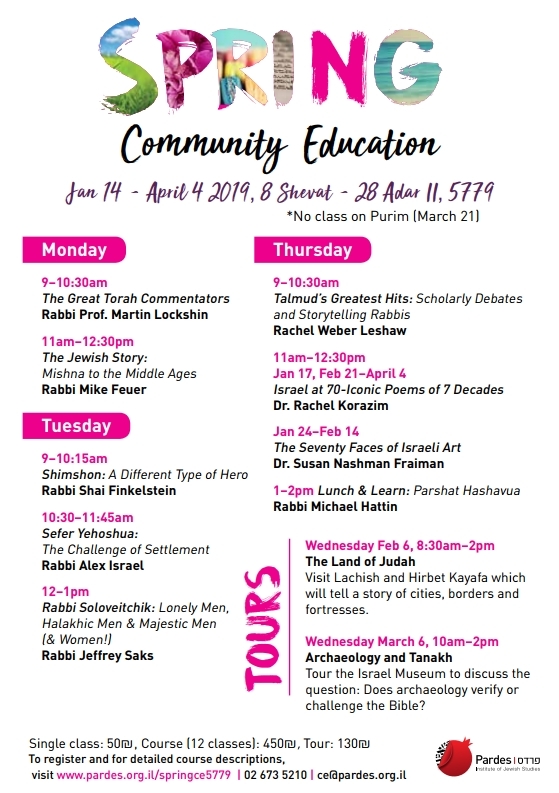 Rabbi Finkelstein lectures at Pardes, OU Israel Center and Yeshurun and he is also the Director of Rabbinic Alliance and Community Engagement in Tzohar. For the past 16 years he was the Rosh Kollel of Torah Mitzion and the Senior Rabbi of the Baron Hirsch Synagogue in Memphis,Tennessee. Rabbi Finkelstein also earned an MBA from the Fogelman School of Business and Economics at the University of Memphis. Rabbanit Nechama Goldman Barash teaches Rabbinic Literature, Women and Judaism, Medical Ethics, Prophets and Bible at Pardes. She made aliyah from Philadelphia over 20 years ago after graduating from Stern College. She studied for three years in Matan’s Advanced Talmud Institute and finished a Master’s degree in Talmud at Bar-Ilan University, with a thesis on the Beaultiful Captive Woman in the Eyes of Chazal. She teaches at a variety of Israeli institutions and is also a graduate of Nishmat’s Yoetzet Halakha program. Recently she has been a member of the Beit Hillel national-religious group. Currently she is studying in Matan’s new Hilchata program, which is an advanced program in the area of Jewish law. Nechama lives in Gush Etzion with her husband and four daughters. Rabbi Michael Hattin is a master teacher of Tanakh at the Pardes Institute of Jewish Studies in Jerusalem. He studied for rabbinic ordination at Yeshivat Har Etzion and holds a professional degree in architecture from the University of Toronto. Michael is the author of Passages: Text and Transformation in the Parasha (2012) as well as “Joshua: The Challenge of the Promised Land”, published by Koren Publishers in 2015. He has served as scholar-in-residence in many communities in North America and Europe and lives in Alon Shevut with his wife Rivka and their five children. 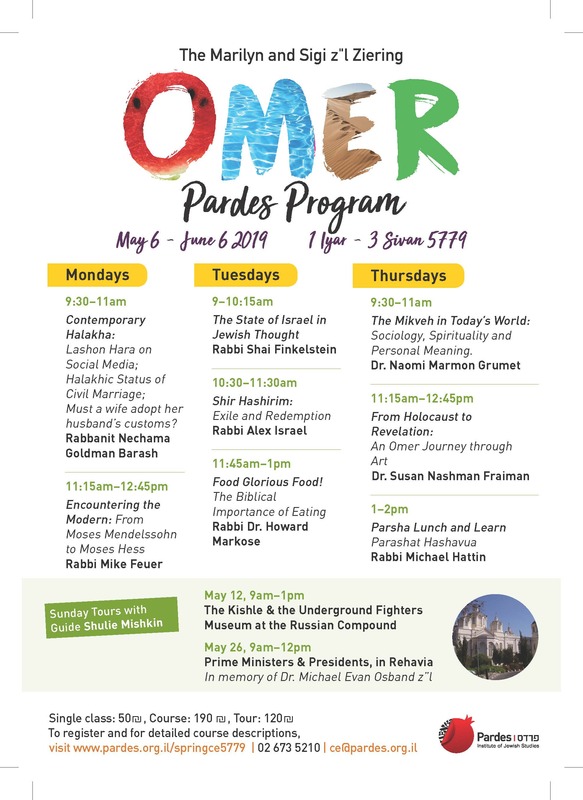 Rabbi Alex Israel has taught at Pardes for the past seven years and is Director of the Summer program, as well as Pardes’s Community Education Program and the Elmad online learning platform. Alex grew up in London and holds degrees from LSE, the Institute of Education London, and Bar-Ilan University. Alex studied at Yeshivat Har Etzion and was awarded semikhah from the Israeli Rabbinate. Alex volunteers for Tzohar – a rabbinic group that works to bridge gaps between religious and secular communities in Israel. He lives with his wife and four children in Gush Etzion. His first book is: I Kings – Torn in Two. (Maggid, 2013). Read his Torah at www.alexisrael.org. Rabbi Howard Markose teaches Bible and Biblical Hebrew at Pardes. He was born and raised in Minneapolis, Minnesota. Howard received his rabbinical ordination in 1984 from the Jewish Theological Seminary in New York. Howard lived in Toronto for ten years from 1984-1994 at which time he served as assistant rabbi at Adath Israel Congregation and rabbi at Shaar Shalom Synagogue. He and his family made Aliyah in 1994 and after seven years as rabbi of Kehilat Moreshet Avraham in Jerusalem, he became the Director of Education for the Young Judaea Year Course. He received his PhD in Bible at Bar Ilan University in January 2016. Howard conducts specialized Bar/Bat Mitzvah ceremonies for families from North America who are visiting Israel. He lives in Jerusalem and is married and has four children. Dr. Naomi Marmon Grumet is founder and director of the Eden Center, a center to make mikveh welcoming and relevant for modern women. Her doctoral research, “An Examination of the Interface of Taharat Hamishpacha and Identity among Modern Orthodox Women and Men”, in which she interviewed husbands and wives in couples who observe niddah, is the catalyst upon which the Eden Center was founded. She lives in Jerusalem with her husband and three children. Click here to apply for the Spring program. Click here for full 2018/19 brochure. Click here for the list of all upcoming evening lectures. 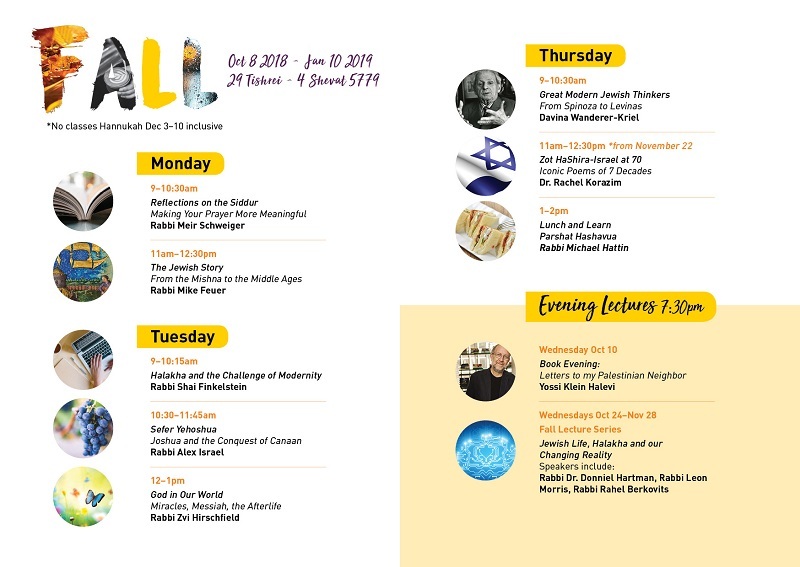 You can purchase a Pardes Pass for admission to all 2018/19 evening lectures: 400 NIS. Email ce@pardes.org.il. Click here to apply for the Fall program. 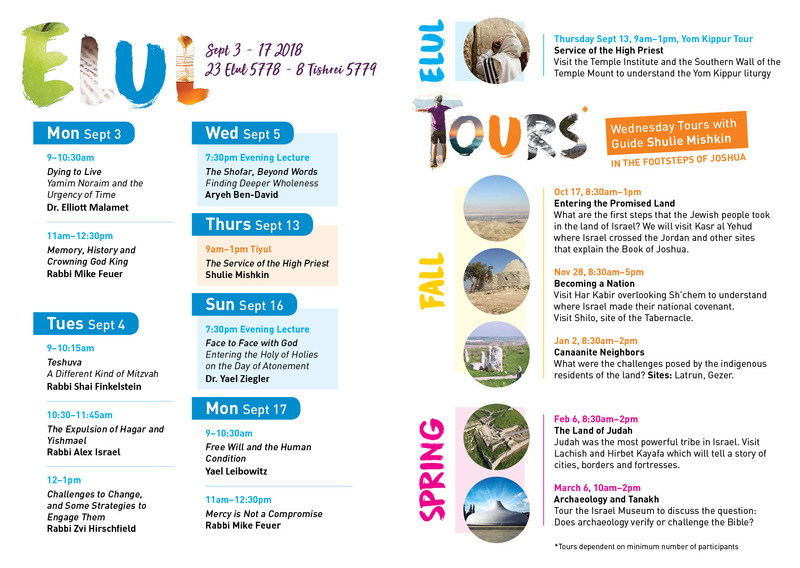 Click here for 2018/19 Elul registration. Would you like us to contact you about classes? Fill in this short form and someone will be in touch.